Pat dry the fish with paper towels. Make a few slits on both sides and then season the fish with salt. 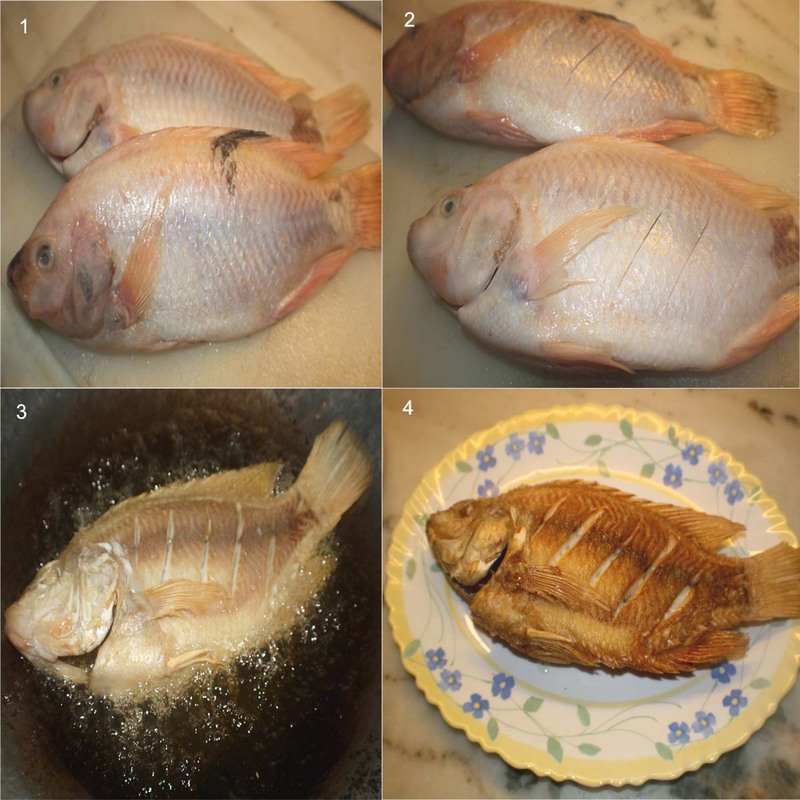 Heat oil in a wok or a big frying pan and deep fry the fish till it is cooked and golden brown. Remove the fish, drain it on a paper towel and and then place it in your serving dish. Once you place the fish on the serving plate, top it with chopped coriander leaves, shredded carrots and some of the chopped green onions. To make the sauce, heat 2 tbsp of oil in a pan and fry the ginger, garlic, chopped onions and green onions and fry for 1-2 mins until it fragrant. 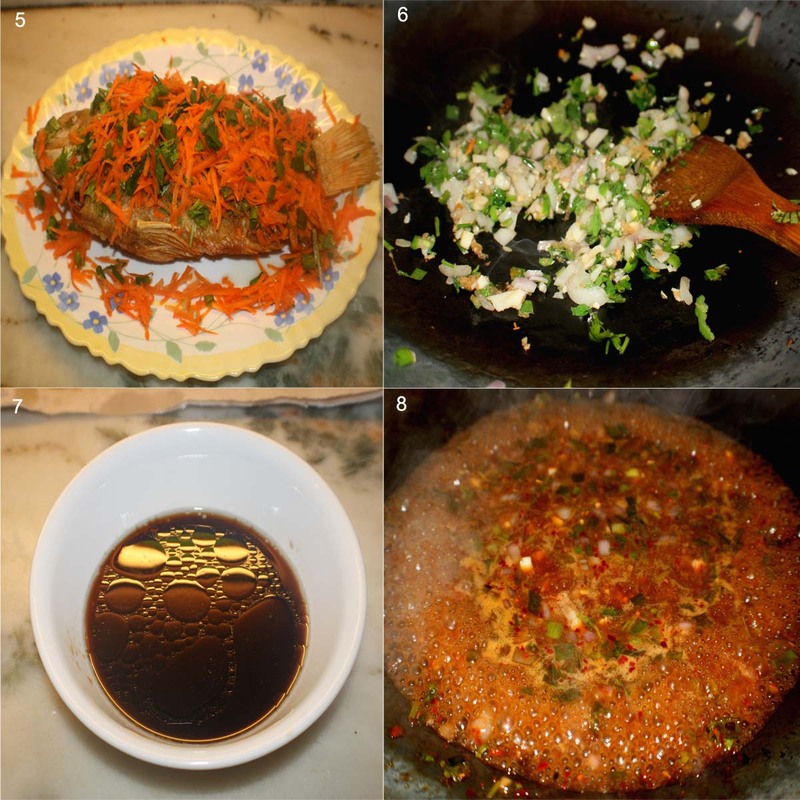 In a small bowl, mix the vinegar, soya sauce, sugar, fish sauce, sesame oil, white pepper and water. Add this to the fried onion, ginger and garlic. Then add the chilli flakes and let it simmer for 2-3 mins til the sugar dissolves . Add the corn flour and water mixture to thicken the sauce. Simmer for a minute and turn off the heat. Taste the sauce and adjust the desired level of sweetness or heat by adding more chili peppers, sugar or vinegar. Pour the sauce over the fish and garnish with additional cilantro and green onions. Serve immediately with steamed rice. 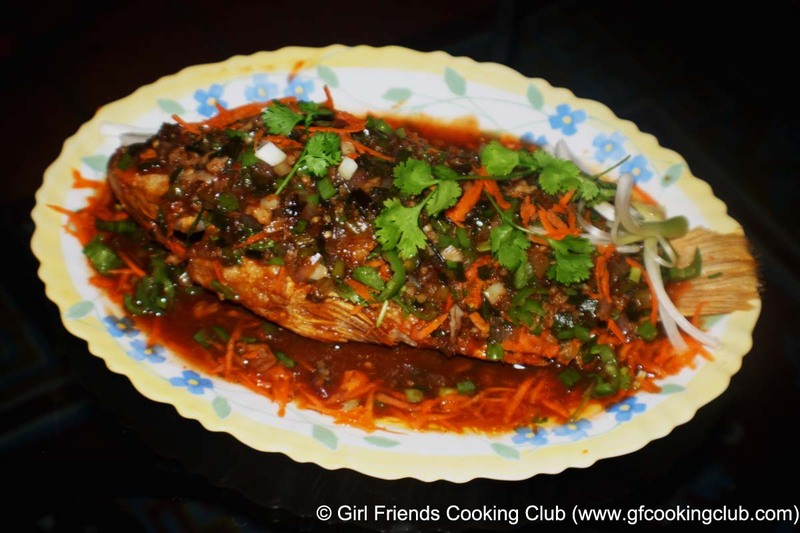 This entry was posted in All Recipes, Fish and tagged Red Snapper, Whole Sweet and Sour Fish by Kamakshi. Bookmark the permalink.